The Illustrated Atlas of Architecture and Marvelous Monuments is chock full of graphic whimsy and quirky trivia. Created by the French artistic design team of Sarah Tavernier and Alexadre Verhille, this version has been effectively translated into English by Noelia Hobeika. Verhille’s background as an illustrative cartographer shines at the very beginning of the Atlas. The table of contents page itself is a map of the world with each continental region assigned a name, a color scheme, and page numbers. The reader is invited on a journey around the world to discover architectural masterpieces from different cultures and eras. From Europe to Africa, through Asia and Oceana, and ending in the Americas, Tavernier and Verhille maintain a consistent organization of a wealth of information, statistics, and illustrations. Maps accompany every page so one can never get lost. Color schemes are paired with individual countries, and each building is assigned a number which traces back to the map of the continental region with which that building is associated. While some of the bold color combinations take a bit of eye adjustments, particularly the hot pinks, reds and oranges of Asia and the Far East, the overall organizational design in the Altas is unique and clever. The information included covers a wide range of interests that would appeal to any nine to twelve year old learning about facts and figures. For instance, on the primary continental map pages, the number of countries, time zone ranges, population numbers and percentages, surface areas measurements, temperature ranges, and a brief blurb about historical architectural influences all flank a thoughtful map highlighting the buildings that will be included on the following section pages. Each region is further broken down into smaller country groupings, and it is here where the construction facts are plentiful. For instance in Northwest Africa the reader learns about mosques, theaters, a basilica, a modern bank building and national monuments in Morocco, Tunisia, Libya, Algeria, and seven other bordering countries. One learns that the Basilica of Our Lady of Peace in Yamoussoukro, Ivory Coast took three years to build between 1986 and 1989. The Guinness Book has named it the biggest Christian edifice in the world and the highest basilica in the world reaching 520 feet. It has 79,000 square feet of stained glass windows and 18,000 seats. Due to the nature of the graphics, with the buildings and monuments all abstract artistic renderings of the actual structures, the grandness and impressiveness of a few structures is completely lost. The Great Mosque in Kilwa Archipelago, Tanzania, is the most important of the Swahili culture from the 11th century and is a UNESCO World Heritage Site, but the graphic shows only a series of very dark nondescript brown arches. There is no sense of place, setting, age, or style; these could be arches anywhere in the world. In contrast, the graphic for The Registan of Samarkand in Uzbekistan includes more architectural detailing resulting in a better understanding of the place, setting, age, and style of this unique building. 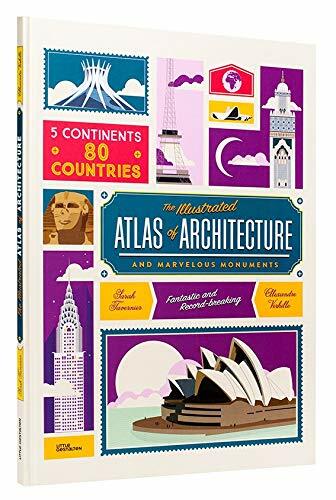 Fortunately, the majority of the buildings and monuments are easily relatable and very effective at making this bold and beautifully designed Atlas eye catching and informative.